Aar Maanta recently stood next to a three-foot-tall image of his face as one of his music videos played on a pull-down screen. 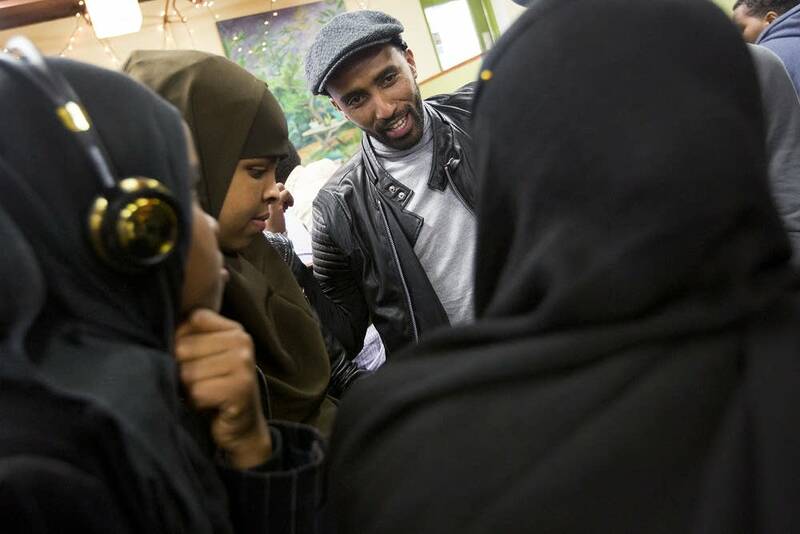 Surrounded by girls in brightly colored headscarves and guys in even more vibrant athletic shoes, the popular London-based singer talked about his work at The Common Table in Minneapolis. "There's a term that's been used for my music: afro-hop," Aar Maanta tells them "Afro because it's African music and hop because it's hopping from different genres — jazz, reggae, house music." 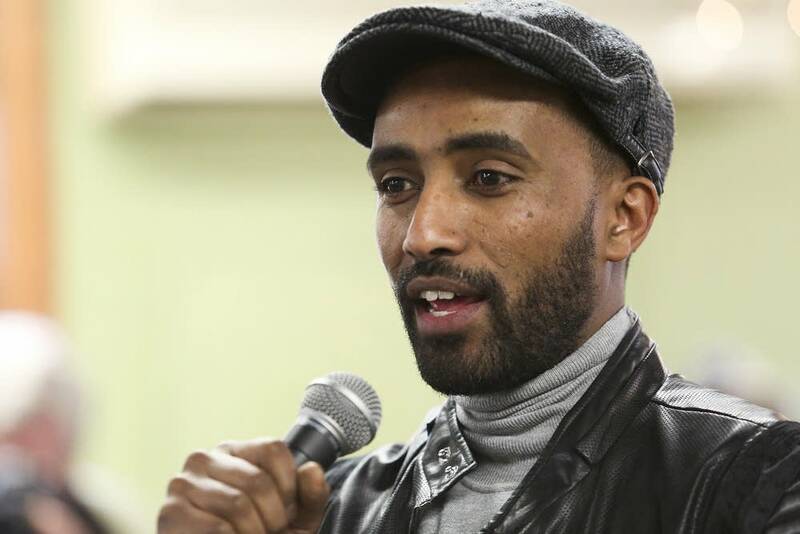 On Saturday, Aar Maanta will bring that combination to the Cedar Cultural Center in Minneapolis, where young Somali-Americans are eager to hear him. The visit to The Common Table was one of many Twin Cities stops for Aar Maanta during a weeklong fellowship sponsored by the Cedar Cultural Center and Augsburg College. "Oh, my god. I love everything about this residency!" she exclaimed. The program brings in Somali artists from around the world to help create cultural connections, Ibrahim said. "Music is a common language that everybody can understand," she continued. "Youth, millennials, older generation, Somalis, non-Somalis, this program brings all of them together." When choosing this spring's artist-in-residence, Aar Maanta was one of the first musicians to come to mind, said Adrienne Dorn, the Cedar's director of development. "Most Somali artists are singers who sing to playback or lip sync even," Dorn said. "Aar Maanta is one of the only — if not the only — Somali musical artist who has his own live band. He's kind of forging a path." In Minnesota, putting together a music group likely isn't too difficult. But in Somalia, Dorn said, armed conflict has a way of shutting down jam sessions. "When the civil war broke out in the early '90s, a lot of the existing musical groups had to flee the country," she said. "Instruments and recordings were looted and destroyed. But there was also this wave of conservatism so all of a sudden artists, where they were once leaders in their community, were now kind of looked down upon." For Aar Maanta, changing that has become a mission. "Reviving live music, that's the reason why I am here today," he said during a panel discussion about writing music for the Somali diaspora. He found a receptive audience at Augsburg College in Minneapolis, where students are attracted to his afro-pop style. 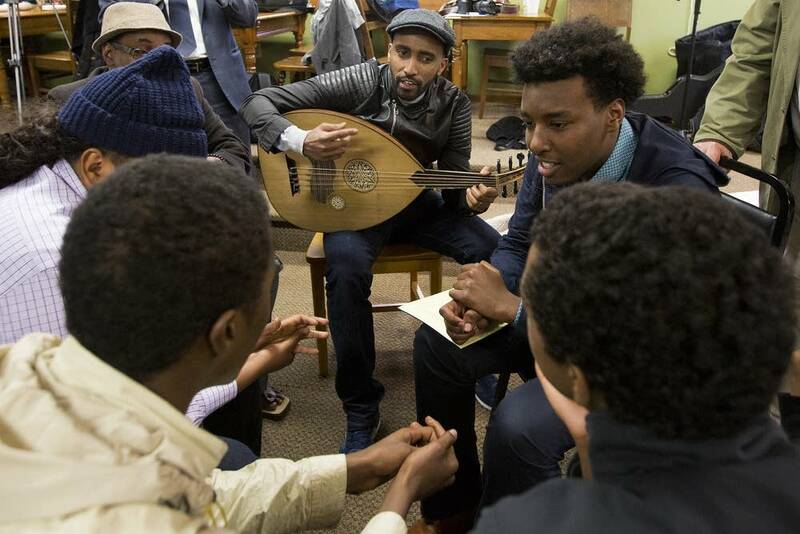 Somali-American student Abdir Ahmandahir sees traditional Somali music as an important reflection of his heritage. But it's not what he wants to hear in his headphones when he's walking across campus. "Most of the music is geared toward older Somali people or Somalis currently in east Africa," Ahmandahir said. "I don't relate to songs about giving up 20 camels for a girl's heart. I might have to sign a pre-nup, but not 20 camels." Like 18-year-old Ahmandahir, Somali-born Fadumo Ibrahim is always looking for music that speaks to the Somali diaspora. For her, Aar Maanta strikes the ideal balance between traditional and progressive. "Of course, I love all his songs," she said. One of her favorites casts the Somali singer in the role of stay-at-home dad. "He's talking about how the culture shifted, because back at home mothers were stay-home mothers, the nurturers," Ibrahim said. "The men used to be, 'I'm the breadwinner. I'm not gonna stay home.' But now your wife works. And it's OK. Understand that that's now OK. That's one of his songs that I say, 'Yes, yes. If all Somali men could be just like that, it would be perfect.'" Aar Maanta aims to make music that reaches uprooted Somalis, which addresses the unique issues of those living outside of their homeland. He hopes more Somali artists will do the same. "Musically," he said, "It's a really good thing to see, the revival of Somali culture and music. "And things can only get better."